Lavender essential oil is one of the most complex naturally-occurring plant oils. Besides its wonderful fragrance, centuries of documented experience along with modern science have established the oil's many naturally-occurring properties. One of these properties acts as a sedative, or sleep aid. If you struggle with insomnia or just can't seem to "turn your mind off" at night we highly recommend applying 1-2 drops of Lavender Essential Oil above the upper lip at bedtime as a soothing, calming sleep inducer. 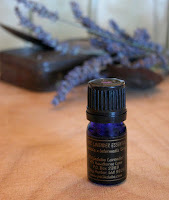 Want to learn more about Lavender Essential Oil? Click here.